You won’t regret putting any of these plant-based, high-protein dishes on your table. The research is clear: Eating plants is good for your health—and the more, the better. But you don’t have to be a full-time vegetarian to benefit. In fact, a 2017 observational study from Icahn School of Medicine at Mount Sinai found that adults who adhered to a plant-based diet most of the time had a lower risk of heart failure than those who ate a diet higher in meat and processed foods. 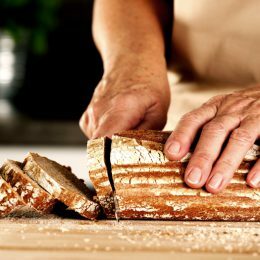 Meanwhile, a 2018 study found eating more monounsaturated fats from plants—and fewer animal fats—may lower the risk of dying from heart disease. These studies don’t prove cause and effect, nor do they give specific guidelines about what constitutes a “mostly plant-based diet,” but it’s fair to say that adding a few meatless meals to your dinner rotation is a good idea. The challenge, of course, is that protein is important too. And while it’s absolutely possible to meet your daily protein needs without meat, it does require some creativity. When you’re low on inspiration—or time—turn to these six protein-packed meatless meals. All deliver at least 23 grams of protein per serving and are filled with plenty of fiber and nutrients, thanks to veggies, whole grains, beans, and legumes. Each recipe serves two as a main course, but many also make great side dishes! The recipe will serve four as a side dish, but a larger helping with an egg on top makes for a satisfying protein-packed meal. Gorin also suggests serving it alongside a greens-and-chickpea salad for extra nutrients, fiber, and protein. What to do: Preheat oven to 375˚F. Meanwhile, use a fork to poke several holes in the spaghetti squash, then microwave until the squash becomes slightly tender, about 4 to 6 minutes. Slice squash in half, and remove seeds and membranes. Place halves with cut side up on a nonstick baking tray, and brush the tops with ½ teaspoon olive oil. Roast until fork-tender, about 40 to 50 minutes. Meanwhile, place onions in a medium pan, and add a small amount of water, so that onions are just covered. Cook over medium-high heat until onions become translucent and most of the liquid has evaporated. In a blender, puree cottage cheese, chives, oregano, lemon juice, and remaining olive oil. Set aside. Once squash is cooked, remove from the oven, and set aside to cool. Use a fork to shred the squash into a large bowl. Toss with marinara. Heat a large nonstick skillet over medium heat. Add eggs and cook until whites are set, about 3 minutes. 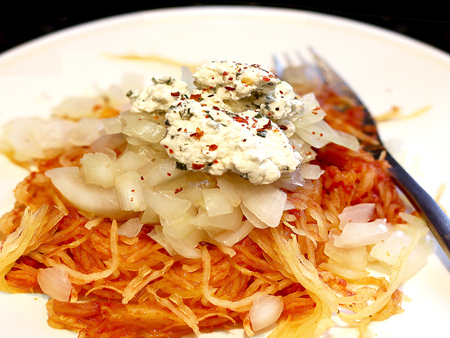 Divide squash into two bowls, and top each with onions, cottage cheese, and a fried egg. This grain bowl comes packed with protein, thanks to quinoa, plus a fiber-rich blend of arugula, tomatoes, and squash. If summer squash isn’t available, try subbing thinly sliced carrots, asparagus, or eggplant. What to do: Coat a cast-iron grill pan (or a grill) with nonstick spray. Grill onions, garlic, and squash over medium-high heat, flipping once, until desired tenderness. Grill lemon wedges until slightly browned, turning once. Meanwhile, combine olive oil, balsamic vinegar, maple syrup, and Dijon mustard in a sealed container, such as a mason jar. Shake until well combined, and set aside. Place a bed of arugula in two bowls, and top with quinoa. 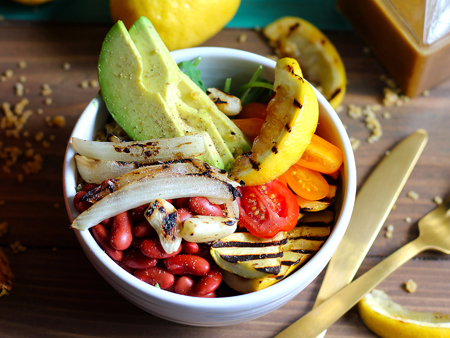 Add grilled vegetables, tomatoes, beans, and avocado. Season with salt and pepper, and drizzle with maple-Dijon dressing. Add lemon wedge, and enjoy immediately. 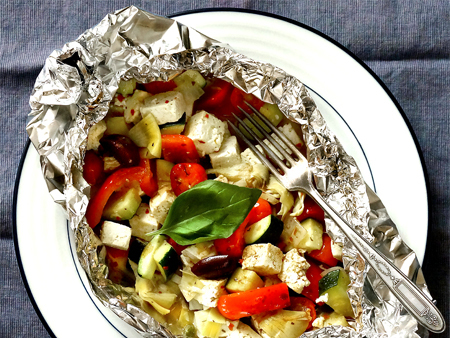 If you’re looking for a one-pan meal that requires minimal cleanup, foil packs are a great option. You can cook them in the oven or on a grill, and your ingredients will gently steam as they roast, which means they’ll really soak in flavors from whatever herbs, oil, vinegar, or other seasonings you use. Miho Hatanaka, R.D.N., makes this Italian-inspired version with artichokes, veggies, olives, capers, tofu, fresh basil, and a little oil and vinegar. What to do: Preheat oven to 375˚F. Cut two 18-inch-long sheets of heavy-duty foil, and cover with cooking spray. In large bowl, mix artichoke hearts, bell pepper, tomatoes, zucchini, onion, olives, garlic, capers, honey, red pepper flakes, oil, and tofu or meat alternative. Divide evenly among sheets of foil. Bring up two sides of foil so edges meet. Seal edges, making tight ½-inch fold. Fold again, allowing space for heat circulation and expansion. Fold other sides to seal. Place packs on cookie sheet. Bake for 15 to 20 minutes, or until vegetables are tender. Carefully fold back foil, and garnish with basil. Drizzle with balsamic vinegar (if using). 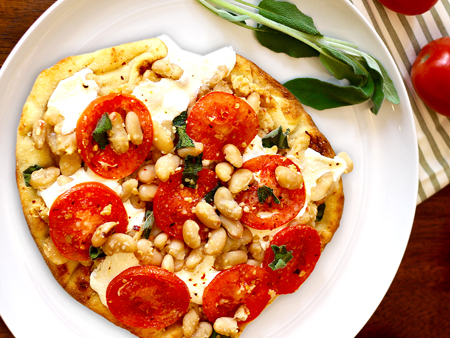 To make the meal more filling, toss leftover white beans, tomato, and sage with balsamic vinegar for a quick side salad. What to do: Preheat the oven to 400˚F. In a bowl, combine beans, olive oil, and garlic. Reserve one-third of the mixture, and set aside. Mash remaining mixture with a fork, and spread on top of naan. Top with mozzarella, tomato slices, and remainder of bean mixture. Add red pepper flakes, Parmesan, and sage. Bake 12 to 15 minutes. Slice and serve. As long as you can tolerate gluten, seitan is a great meat substitute, with a heartier texture and stronger flavor than tofu. It’s very high in protein (21 grams of protein per ounce) and won’t crumble apart when cooked. Hatanaka makes this flavorful meal with eggplant, seitan, and hoisin sauce. You can eat it straight up or serve it over one cup of brown rice. What to do: Cut eggplant lengthwise into 4 thick slices. In a small bowl, combine olive oil and sesame oil. 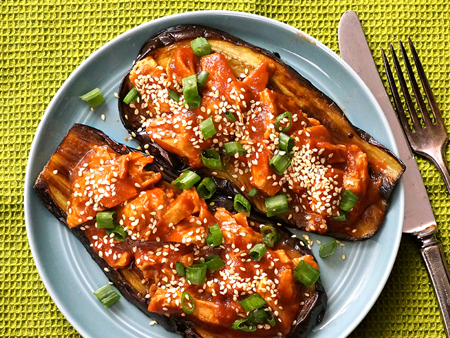 Brush eggplant slices very lightly on both sides with about half of the oil mixture. 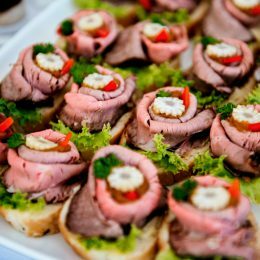 Arrange in a single layer on a plate or tray. Sprinkle both sides of eggplant slices with salt. Heat a large cast-iron skillet over medium-high heat. Add eggplant slices, and cook for about 5 minutes per side. Set aside. Toss seitan with remaining oil mixture. Add to cast-iron skillet over medium-high heat, and cook about 3 minutes per side. In a small pan over medium heat, combine tomato puree, hoisin sauce, and agave nectar, and stir together to make sauce. Add seitan to the sauce, and stir to combine. Serve seitan and sauce mixture over eggplant slices. Sprinkle with scallions and sesame seeds. 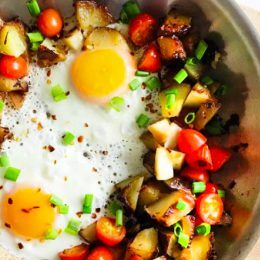 This recipe is great with summertime tomatoes, but cherry tomatoes make it possible year-round. Tessa Nguyen, R.D., L.D.N., turns the tangy salad into a meal by serving it over a bed of grains and topping with an egg. A soft-boiled egg works great, but any preparation will do! 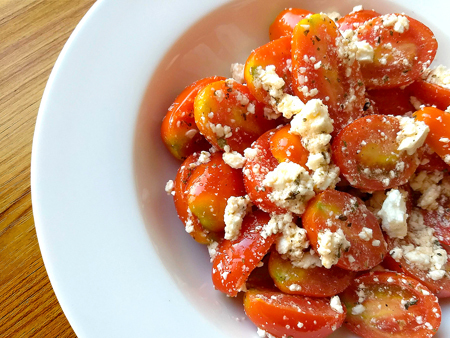 What to do: Mix together cherry tomatoes, feta, basil, olive oil, salt, and pepper in a big bowl. Serve in two bowls over quinoa, and top each with a soft-boiled egg. Photos of Italian Roasted Vegetable and Tofu Foil Packs and Eggplant Seitan Stir-Fry: George Karabotsos.